Home > Blog > New Products > Virtue Spire 260 Paintball Hopper is in stock and shipping! UPDATE: The Virtue Spire 260 is now in stock and ready to ship since this blog post was first published. All colors are available! Virtue has made the official announcement that the Virtue Spire 260 Paintball Hopper is indeed on the way. The redesigned shell is barely 1/2 inch taller than a standard Spire hopper (but still smaller than other standard sized loaders). This extra capacity may not seem like much but in tournament paintball it gives the back player a few extra crucial seconds of fire or a support gunner in woodsball the chance to top up before running empty. 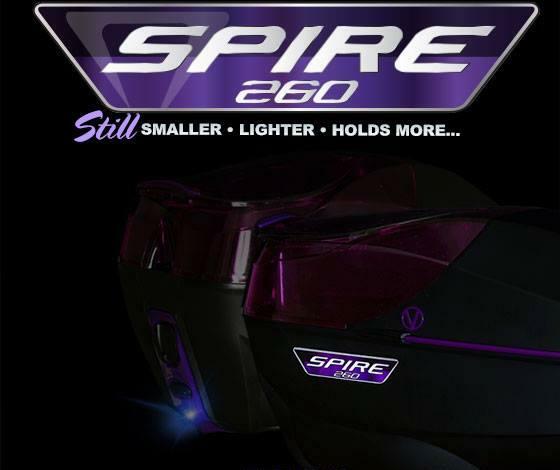 The Virtue Spire 260 Hopper colors currently available are Black/ Black, Black/ Lime, Black/ Purple, Black/ Blue and Black/ Red. If you already have a Virtue Spire Hopper then you can just get the Virtue Spire 260 Upgrade Shell. All you do is simply swap the internal loader tray and backshell from your current Spire into you Spire 260 Shell and you have increased your ammo capacity in seconds! Remember to go to Paintball Online.com to look for your Virtue Spire 260 for sale!